Training for a half marathon is never easy. 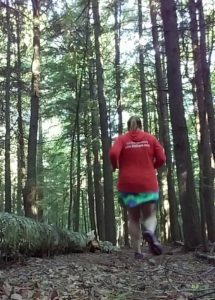 Training for a fall half marathon can be especially tough! But when you have your tribe behind you, everything gets a little easier! It’s been a while since I touched base with you all about training for this race, so it was time to sit down and have a chat! 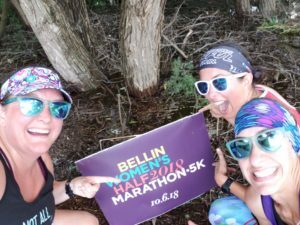 Time for an update on training for the Bellin Women’s Half Marathon! Anyone who lives in the midwest knows that this summer was not the most ideal weather for long distance running and race training! 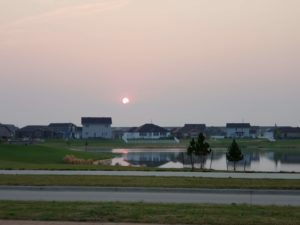 Looking back on the last few months, we had our fair share of hot and HUMID days! It was so bad that if we didn’t get out and run before the sun came up, getting in a run was virtually impossible. The heat was just too much. 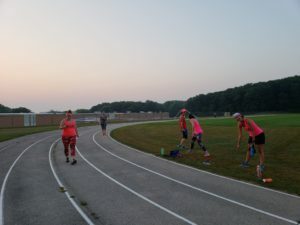 (yes, I know, for those of you living in the southern part of the country, you are accustomed to warmer weather running… here in WI, the heat this summer was worse than normal!) Early morning running did not mean it was any easier tho! Many of those days it was already 95% humidity (or more) at 5am! Then, once we got a break in the humidity, the rain started! In the last 4 weeks, 3 of our Tuesday Morning “Before Breakfast Club” track workouts were cancelled because of thunderstorms! a good training plan and a tribe of friends that I knew had my back! Nate was awesome about keeping my training fresh and new. I never had a chance to get bored with workouts, paces or distances! Each week, I got excited to see what was on the agenda for the next 7 days!! Knowing I had a plan kept me moving. 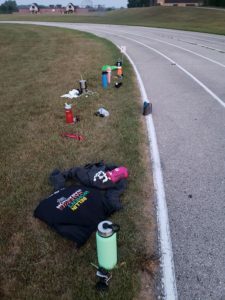 I was determined to get in each of those workouts each week… because I didn’t want to be THAT person who had to email their coach to say that they missed a bunch of workouts! This is where my tribe came in!! 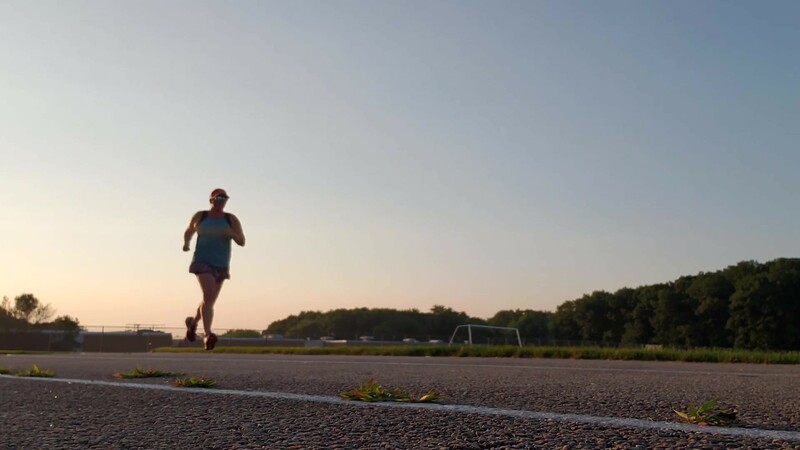 There were several times when I just didn’t want to go out and run… I had every excuse running through my head. It was too warm. I was tired. I needed to do this, or I needed to go there. I was on the road. It was those days when I new that all I had to do was send out a few messages and I would have someone to run with. We ran before the sun came up. We ran in the heat. We ran in the rain. We ran in circles around the track so much that we are all still a little dizzy! We ran up and down crazy hills. 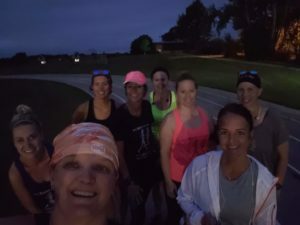 We ran as the sun was going to sleep. 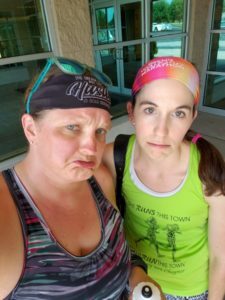 Then there was the day that we headed to the YMCA to run inside to get away from the heat… only to be reminded that the Y closes at 2pm on Sunday’s during the summer. Getting there at 1:30 means you CANNOT get in 10 miles before they close! They also checked in on me when I was on the road! They made sure I got in those miles before heading to work when I was in Fargo. They reminded me that there was probably a YMCA not far from me in Minneapolis when I woke up to a thunderstorm. No matter where we were, we got those miles in. 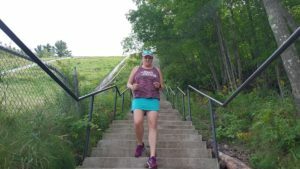 I even stopped at the ski jump in Iron Mountain on my way home from up north to get in a quick workout on the stairs heading up the hill! Now, we are 3 weeks out from the big weekend. We spent the summer running in the heat together and now are enjoying the fall temps as we hit these final weeks of preparation. Tapering is right around the corner, which means race day is even closer! 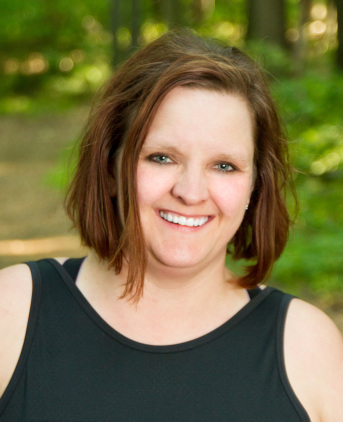 I am feeling more confident about my goals for Bellin and am looking forward to sharing the course with many amazing friends that I have spent the summer training with. Will we hit our goals for the day? Only time will tell. In the meantime, I am going to stay strong to my training and head into the race weekend with a positive attitude! Are you signed up to run? If not, you still have time!! Head on over to the website and get yourself signed up for either the half marathon or 5k! 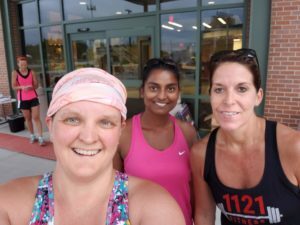 Not up for a half marathon but want more than a 5k? Find a friend and sign up for the half marathon relay! Plus, use the code “BibRave5” to save $5 on your registration!! Now, time to get out there and make things happen!! ⟵Are you setting goals, or creating a list of activities to do?